With email, phone, IM and the Internet, it can connect you. With an integrated organiser, it can help you stay on top of your day. With camera and video recording, you can capture and share the moment with just a few clicks. And that’s just the beginning. The BlackBerry Bold smartphone's support for tri-band HSDPA and enterprise-grade Wi-Fi (802.11 a/b/g) networks and its next-generation 624 MHz mobile processor make short work of downloading email attachments, streaming video or rendering web pages. The BlackBerry Bold also includes 128 MB Flash memory plus 1 GB on-board storage memory, as well as a microSD/SDHC memory card slot that is conveniently accessible from a side door. It comes with the renowned BlackBerry productivity applications, including phone, email, messaging, organiser and browser, and works with thousands of mobile business and lifestyle applications, making it easier than ever to stay connected, productive and entertained. With this powerful new smartphone, users can even talk on the phone while sending and receiving email or accessing the web, and download Word, Excel or PowerPoint files and edit them directly on the handset using the preloaded DataViz® Documents to Go® suite. 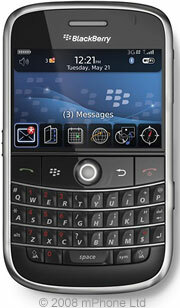 The BlackBerry Bold smartphone comes with the most vivid and bold display ever introduced on a BlackBerry smartphone. Its half-VGA (480x320 resolution) colour LCD is fused to the undersurface of the lens, making images leap out with stunning definition and clarity. Pictures are vibrant and razor sharp, while videos play smoothly and web pages, documents, presentations and messages snap with exceptional quality and contrast. With its newly enhanced, high performance browser and high-resolution, ultra-bright display, the BlackBerry Bold smartphone gives users an on-the-go web browsing experience with desktop-style depiction. The trackball mimics a mouse, making it easy to navigate sites in "Page View" or "Column View" or to zoom in on specific parts of a web page, while various emulation settings allow users to choose between the full desktop-style HTML content and layout or the mobile version. Attachments can also now be downloaded from within the browser and there is support for watching streaming videos (RTSP – real-time streaming protocol). While it is designed to meet the extensive requirements of the business professional during the day, the BlackBerry Bold smartphone also caters to the business person’s consumer side during evenings and weekends. 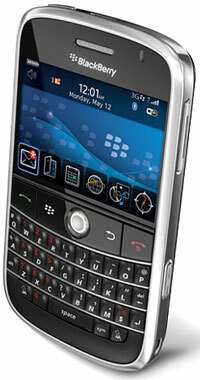 It features a 2 megapixel camera with video recording capability, built-in flash and 5x digital zoom. The enhanced media player can display pictures and slideshows quickly, play movies smoothly in full screen mode, and manage an entire music collection. Audio can be played over the handset’s dual speakers in rich, stereo sound, and when using wired headphones or external speakers, the media player gives the user an equalizer with 11 preset filters - like "Lounge", "Jazz" and "Hip Hop" – that boost or soften audio ranges to create the perfect ambiance. The BlackBerry Bold smartphone features a new acoustic design that increases the size of the phone’s audio sweet spot, improving listening quality and clarity. It also comes with numerous premium phone features including Speaker Independent Voice Recognition (SIVR) for Voice Activated Dialing (VAD), Bluetooth® 2.0, with support for hands-free headsets, stereo headsets, car kits (including car kits that adhere to the Bluetooth Remote SIM Access Profile) and other Bluetooth peripherals. It is a quad-band EDGE and tri-band HSDPA handset that supports global roaming and features dedicated 'send', 'end', and 'mute' keys, smart dialing, speed dialing, conference calling and call forwarding. It also features noise cancellation technology that offsets background noise, a powerful speaker phone and support for polyphonic, mp3 and MIDI ring tones.